VMware Update Manager U3e upgrade failing? Un-install it! 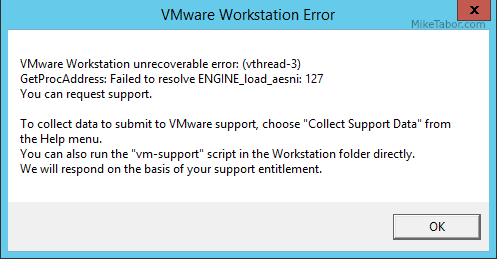 Looking for a possible solution at the VMware Knowledge Base came back with no results and to error message wasn’t overly useful either with “VMware Workstation unrecoverable error: (vthread-3)” as Workstation wasn’t installed on this server. So in theory the upgrade should have worked just fine, but even still the error at top continued. Lucky for us the fix is quick and easy – simply un-install VUM. Un-install the existing VUM instance. Re-run the VMware Update Manager U3e installer and install VUM as normal. Your settings and baselines will not be effected as they are stored in the database and so long as you tell the installer to use the existing database all that information will be there after you re-install Update Manager Update 3e. An easy fix for a very useful program! If VMware provides an alternate fix I’ll be sure to update this post.